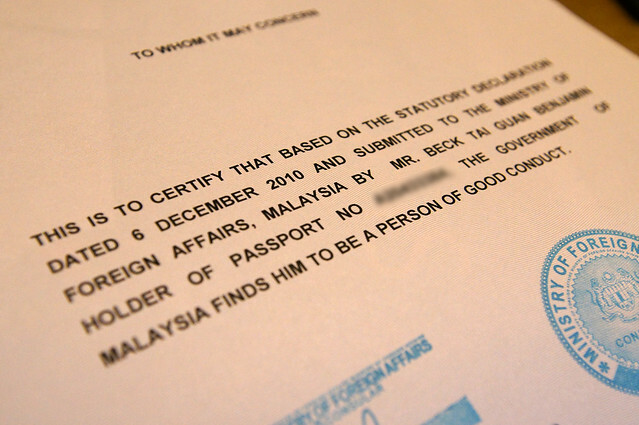 6th December 2010 – Went to Ministry of Foreign Affair to get myself certify as a Person of Good Conduct. Here’s the snapshot of the Certificate issued by the Government of Malaysia, who finds me to be a Person of Good Conduct based on the statutory declaration dated on 6th December 2010. To apply as to be a good people of Malaysia, it’s a tough process as you are being tested on your patience very much. Here’s my guide for those who would require to apply for such certificate based on my experience. Fill in the Application Form for Certificate of Good Conduct. Best to download the form instead of having the thought in getting the form at the Ministry of Foreign Affairs (MoFA). Prepare 2 recent passport size photographs. Prepare 2 certified photocopies of Identification Card (IC) both sides on the same page. Prepare 2 certified photocopies of password contain details of you (first and last page). Bring along your original Passport and IC. My Lesson: I forgot to make photocopies of my passport last page and I had to run around looking for a photocopy machine. I went to the Mamak Stall inside the Immigration Office Food Court to get it photocopied. Make sure you arrive by 9:00 AM. Go to 2nd floor to check if the counter is open, and ask if the person in charge is available to certify your documents (photocopies of Passport & IC). If you have to wait for the person in charge to come in, just wait. Do not go elsewhere to process your document verification. Prepare small change, each photocopies that need to be certify for it’s authenticity cost RM 2. In this case, the total is RM 8. Do make sure you get a visitor pass from the security guard. Do make sure you pasted your IC on the Application Forms. Do get your number at the reception, they will check and arrange your form. Wait for your number, process your application, and make payment of RM 20. My Lesson: I bypass the 1st level security guard and almost got myself kicked out by the 2nd level security guard. There you have it… As a Good Person :) Here I share my experience in getting yourself Certified as a person of Good Conduct in a painless way. hmm, why do you need that cert? There's many use for it. One of the reason is employment. Thank you for the insight! After all this, I am sure you will value the cert very much. how long u can get ur cert?… actually im looking job in singapore.. but they ask the same cert.. u can share something?? Back then you can get the cert within the same day. I heard the process is different now, roughly takes at least two week to approve them if not mistaken.